2 Two Portraits Of Mitt Romney, Businessman The job Romney talks about most on the campaign trail is his leadership of Bain Capital. His supporters say that's where he learned to solve big problems, create jobs and expand companies. His opponents say he made money by shutting down factories, occasionally driving companies into bankruptcy. Creating work for unemployed Americans will be the top priority for whoever wins the 2012 presidential race. In a series of profiles, NPR looks at a key job that each Republican presidential contender held before running for office. In the late 1970s, recently out of Harvard Business School, Mitt Romney went to work for the Boston consulting firm Bain & Co. He was successful, but he says his dream was always to run his own business. In 1984, he got the chance. The firm's founder asked Romney to start an investment fund called Bain Capital. The company would put money into small or struggling businesses, help them grow, and then Bain would cash out. Today, lots of firms do this kind of work, but it was unusual in the early '80s, says Steven Kaplan, who teaches finance at the University of Chicago Booth School of Business. "What Bain Capital did — and was among the first, if not the first, to do it — was to look at the operations before buying the company, as well as after," he says, "and try to figure out, how can we make it better and then help the management team to improve the company." In other words, Romney applied business consulting techniques to the investment business. "Many venture capitalists write you the check, and if you don't see them again, that's a good thing in the entrepreneur's mind. That was never true for Mitt," says entrepreneur Tom Stemberg, who had an idea almost 30 years ago to create an office-supply superstore. His pitch to Romney was that the average white-collar worker consumes about $1,000 in office supplies per year — so there's huge room for savings. Romney asked around, and businesses told him, nope — they only spend about $200 a year per worker on office supplies. In 1998, Domino's Pizza founder and Chairman Thomas Monaghan and Mitt Romney, then-managing director of Bain Capital, sign an agreement for Monaghan to sell a "significant portion" of his stake in the company to Bain. With Romney at the helm, Bain Capital helped launch or reshape hundreds of companies, including Staples and Domino's Pizza. Romney called Stemberg with the bad news. "And I go, 'Well, Mitt, the reason is that people don't realize how much they're spending. And if you went in and added up what they're actually spending, you'd find out I'm right.' "
Stemberg figured the deal was dead. But Romney went back to the businesses, this time with a calculator — and he asked for their receipts. A week later, Stemberg's phone rang again. "He said, 'Gosh darnit, you're 100 percent right,' " recalls Stemberg. " 'People just don't know how much they're spending. They're actually spending $1,100 in office products, and therefore saving 50 percent could really be a big idea.' And it turned out, obviously, it's become a $25 billion business today, so it was a pretty big idea." That $25 billion business is called Staples. It's one of the earliest Bain Capital success stories. Others followed: Domino's Pizza. Sports Authority. Brookstone. Sealy mattresses. Those deals made Mitt Romney a millionaire hundreds of times over. 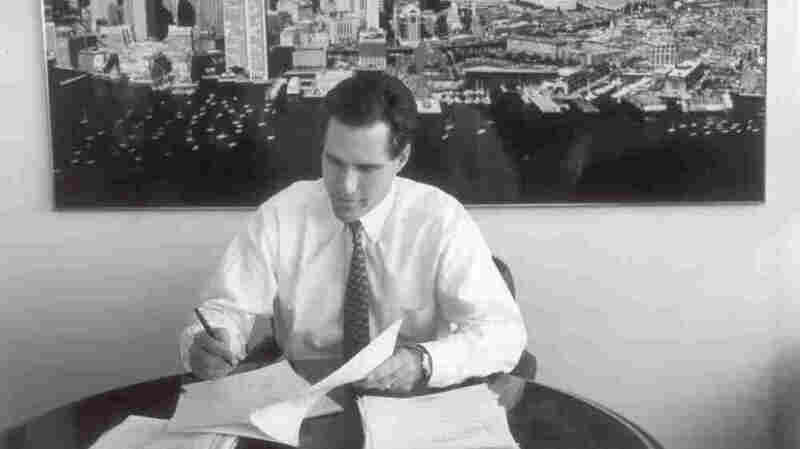 Geoff Rehnert was one of Bain Capital's first employees and left around the time Romney did, 15 years later. "On all the deals that were done during those 15 years, the rate of return was over 100 percent," he says. "I don't believe there's ever been anyone in the history of investing who for over 15 years has averaged over 100 percent." Here's another indicator of just how good Romney was at his job: The University of Chicago's Kaplan says most equity firms keep 20 percent of their profits. "Bain Capital, for a very long time, was one of the only private equity funds, if not the only one, to get a 30 percent share of the profits," says Kaplan. "And the only way your investors give you a 30 percent profit share is if you have performed very well." So what does "performing very well" mean? Romney often equates good performance with job creation. "We added tens of thousands of jobs through the businesses we helped support," Romney said during a debate at the Ronald Reagan presidential library last month. "That experience — succeeding, failing, competing around the world — is what gives me the capacity to help get this economy going again." But Howard Anderson, a former venture capitalist who teaches management courses at MIT, says even though Bain sometimes created a lot of jobs, that wasn't the real goal. "Private equity combines both the best and the worst of capitalism," he says. "When things go well, there's wonderful stories to tell about growth. When things went bad, it is not a pretty system — especially since Bain Capital may have personally done well themselves, where both their investors and the employees did not do well." Romney's opponents have seized on those examples where things went south — places where Bain reaped millions from companies that sent jobs overseas, closed factories or plunged into bankruptcy. Some are familiar names, like KB Toys; others are less well-known, except to the people whose lives were affected — companies like Ampad, DDi, Dade and GST Steel. Donny Box worked for GST, at a steel mill in Kansas City, Mo., for 32 years. A few years after Bain took over, the company went belly-up and the plant closed. Box says Bain ruined the community and his friends' lives. Here's a guy that just took somebody else's money and used it to make more money. The guy has never produced a thing in his life. ... I made something. We produced something. I drive by the old plant probably once or twice a week, and it's just — I mean, it chokes you up. "Guys lost houses, guys lost cars, and I'll tell you what — the ... number of people that had been married 30, 35, 40 years that split up. There were quite a few people that committed suicide," Box says. When Romney says Bain taught him how to create jobs, Box says he still makes statements that cannot be played on the radio. "I just, I think, here's a guy that just took somebody else's money and used it to make more money," says Box. "The guy has never produced a thing in his life. I used to be able to drive by that plant and say, you know, everything that came out [of] that back gate, I had my finger on that somewhere along the line. I made something. We produced something. I drive by the old plant probably once or twice a week, and it's just — I mean, it chokes you up." Although Romney was CEO of Bain during that period, he has said he had no involvement in the layoffs and the plant closure. His defenders say focusing on those cases is like condemning a successful heart surgeon who has at times lost patients on the operating table. 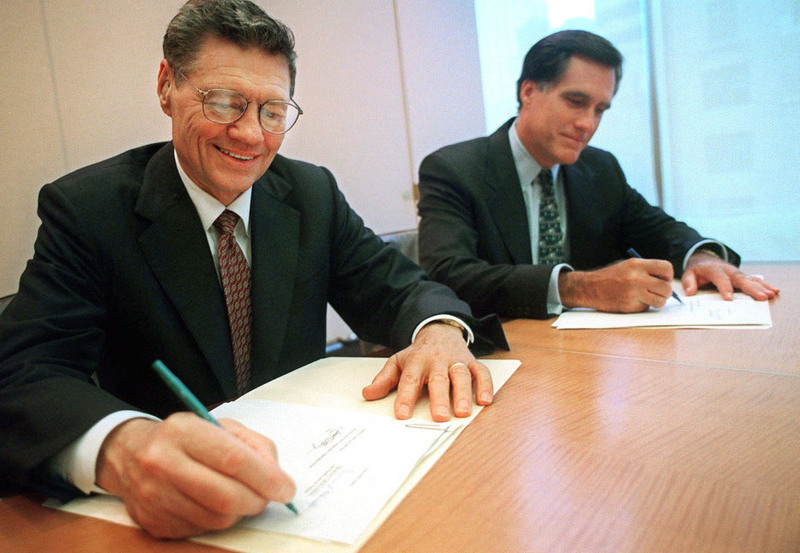 In 1999, Romney went to run the Winter Olympics in Utah, and after that, his political career started to take off. Staples founder Stemberg has remained close with Romney since they first collaborated on the office superstore as young men more than 25 years ago. Asked how Romney has changed now that he's a multimillionaire and a presidential candidate, Stemberg replies: "It's the same guy; he's still a cheap son of a gun."